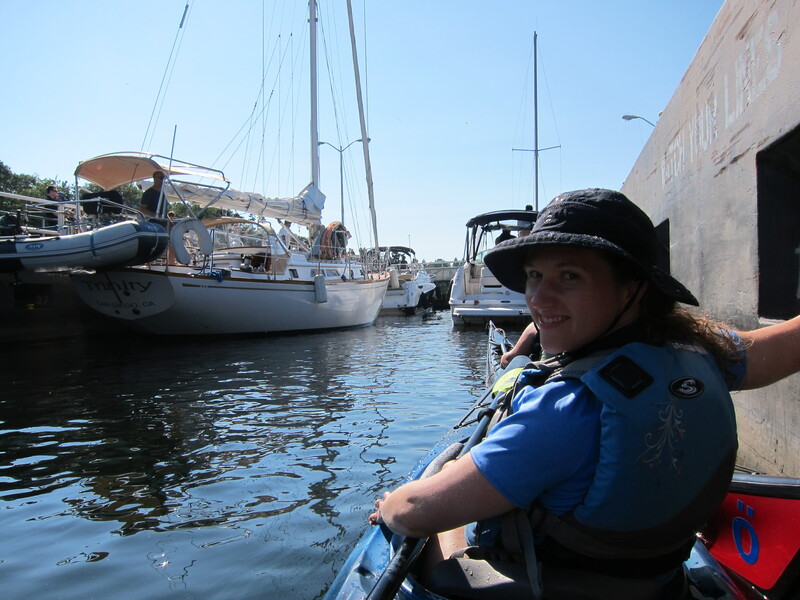 One sunny day last summer we decided to take Manitou II through the locks. 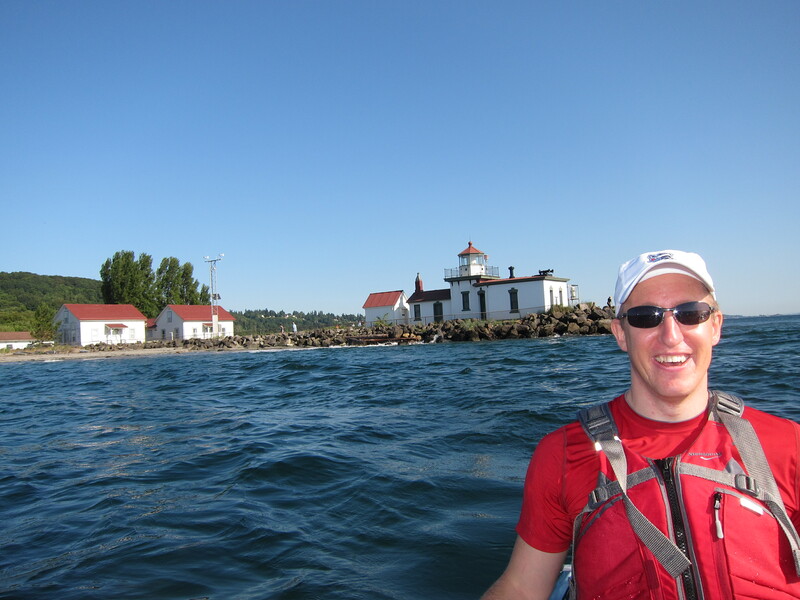 We put in at 14th Avenue NW Boat Ramp in Ballard and traveled West on Salmon Bay to the Ballard Locks. Before the trip I was trying to google and YouTube information, freaking out we’d be among monster boats. The most useful website I found was through NW Boat Info. There are two locks (large and small) so we were directed (by a guy with a loudspeaker) to the smaller lock. When we were closer to him he directed us to a specific spot (and told us how impressed he was that we passed a sail boat on our way over). Then we just held onto the sides (as pictured) as the water levels changed to let us out on the other side (not fast but still exciting) without difficulty. Once out of the locks we headed left until we got to Discovery Point for a photo op with the lighthouse. 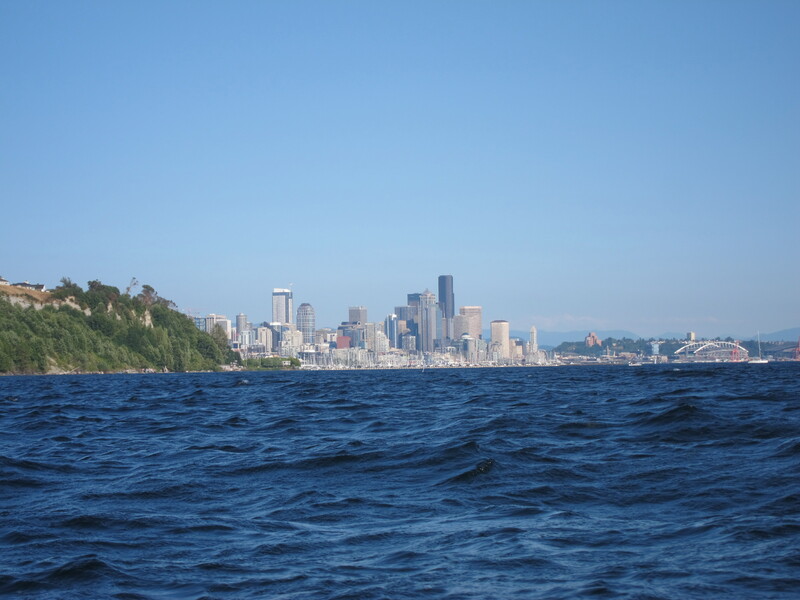 Then we traveled towards downtown, which was much easier than on our return voyage against the winds and current. We stopped near the lighthouse for lunch but ate quickly because our wet clothes quickly became cold in the wind. Unfortunately waves had really picked up at our little beach and we’d never dealt with surf before. We tried sideways, straight on, Alex launching me then jumping in and visa versa. Our main problem was that we couldn’t get our skirts on fast enough to keep the water out. 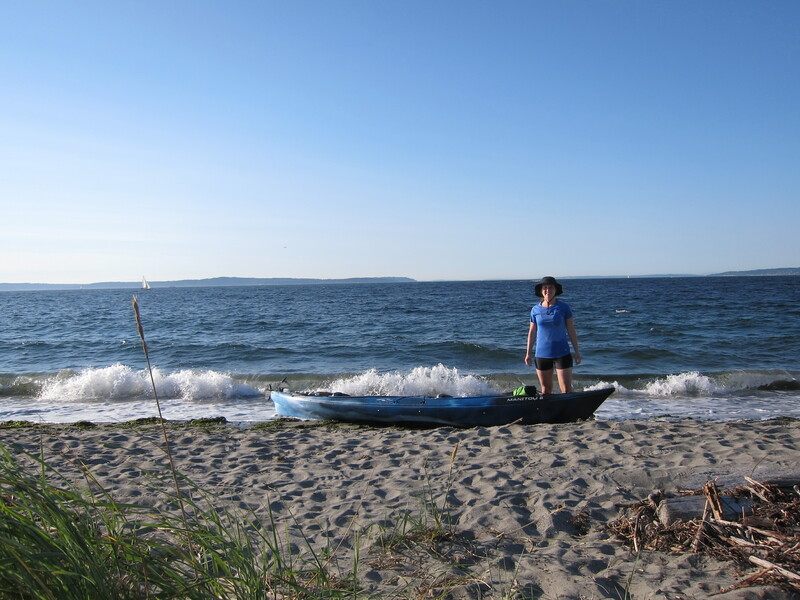 We tried paddling through despite the waves crashing in our boat, hoping we could just pump it out later, and thought we were victorious until the water inside the kayak sloshed back and forth, almost knocking us completely over. In our efforts to pump the water out and regain control we found ourselves somehow back on shore. Soaked, freezing, and without a clue, we were brainstorming what to try next when a couple walking along the beach took pity on us and pushed us out with our skirts already on, heading straight towards the waves. Watching YouTube videos later we realized that’s what we should have started with, and could have pushed ourselves out with our knuckles, but then we’d have one less story to tell around the dinner table.